Manuka honey has taken its time to make its way to the Philippines, but the natives of New Zealand have known of the healing power of this monofloral honey for centuries. It’s not just useful in your medicine cabinet, though. It has some pretty potent uses as a skincare and beauty product, too. You can easily buy a jar of manuka honey and slather the sticky, sweet goo all over your face, but you have to make sure it’s authentic manuka. Otherwise, you’re just probably putting sugar on your face. Also, manuka blended with a trove of other skin ingredients just makes it all the more powerful. Of late, I have been seeing beauty products made from manuka honey being sold in Philippine malls; and, I have been reading quite a few online reviews for these skincare products. Specifically, I have been seeing Organi’s Manuka Honey Gentle Peel being peddled by good-looking foreign salesmen out to make a buck off you. At least, that’s how it might seem. I took home a jar for myself, but I bought it online instead of at the mall. (I don’t know how to say no to all those offers!) I have a huge problem with pores that are wide open, and I know manuka honey contains amino acids that provide gentle exfoliation and help with pores. I was pretty excited with what this product can do! Honestly speaking, as I review this, I was a little dismayed at how small the jar was. For its price, maybe Organi could have added a bit more. The jar looks pretty, though, and it does feel a bit heavy in my hands. Inside is a sticky, orange-y kind of gel that you scoop out with the plastic spatula that comes with the product. I like that Organi has thought of this, as you don’t really know what germs you’re mixing into the product when you dip your hands into it. 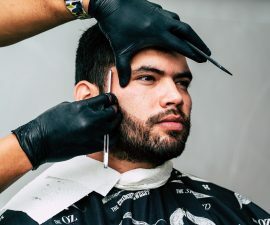 The gel is a bit viscous, at first, but it turns into a more water-like consistency when you spread it out all over your face, so it’s very easy to apply. It doesn’t smell like anything, which is fine, but I’m a sucker for sweet scents and would have fallen in love immediately if I could smell honey on my face. The instructions say to massage the gel all over your face for a few minutes. You’ll feel flaky bits of skin coming off and forming into little white balls! Gross, I know, but fascinating at the same time. Afterwards, rinse with lukewarm water, pat dry, and apply your favorite moisturizer. Will I buy it again? If this keeps up and my skin keeps improving, I will definitely buy this product again. Other Organi Philippines manuka honey peel reviewers have said a tiny jar can last for an entire year, though, so I have an entire 12 months to make that decision. 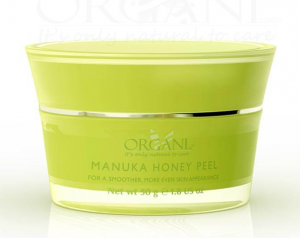 Meanwhile, if you are suffering from major acne problems, redness, or itching, I do recommend Organi Philippines’ Manuka Honey Gentle Peel for you. Not only will the manuka honey content help with those problems, you also have the added anti-aging effects as a bonus. I also found another Organi Philippines review to check out and research this weekend! Here’s to clearer, brighter, healthier skin!